The China Intelligence Monthly covers a variety of aspects of Chinese maritime, these include the Chinese fleet, orderbook, seaborne trade and much more. 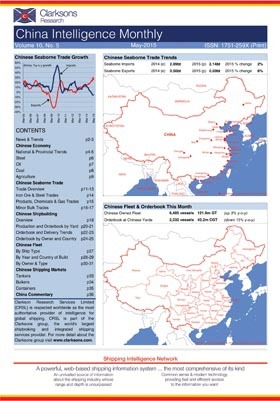 China Intelligence Monthly provides a unique one-stop access to key data on seaborne trade, shipping, shipbuilding and logistics of the world’s most dynamic economy. In its familiar “at a glance” format Clarksons Research sets out monthly detailed information on Chinese seaborne imports and exports for all major commodities, with special focus on the Chinese oil and steel industries, the development of the Chinese container shipping market and a review of Chinese economic indicators. A separate section concentrates specifically on the Chinese fleet and orderbook and Chinese shipbuilding. China This Month - News & Trends. Chinese Economy - National & Provincial Trends, Steel, Oil, Coal, Agriculture. Seaborne Trade Overview, Exports & Imports Summary, Iron Ore & Steel Trades, Products, Chemicals & Gas Trades, Minor Bulk Exports & Imports. Chinese Shipbuilding Overview, Production by Yard, Orderbook by Yard, Orderbook & Delivery Trends, Orderbook by Owner and by Country. Fleet Trends by Ship Type, Year of Build & Country of Buid, Orderbook by Owner & Type. Freight Markets – Tankers, Bulkcarriers & Containers. Dry Bulk, Tanker & Container Ports – Asia. China Intelligence Monthly is available both in hard copy and in digital format.